Hillview wicketkeeper Leonardo Julien,right, successfully runs out a Naparima player, during the Secondary Schools Cricket League opener, at the Queen’s Park Oval, St Clair, yesterday. 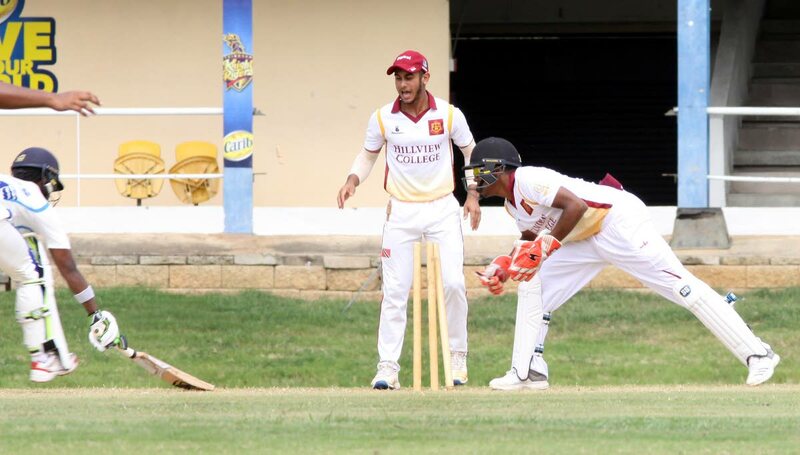 HILLVIEW College made a strong start to the defence of its PowerGen Secondary Schools Cricket League (SSCL) 50-over title with a convincing eight-wicket win over rivals Naparima College at the Queen’s Park Oval in St Clair, yesterday. Chasing a revised target of 113 in 36 overs after multiple rain interruptions, Hillview eased its way to 117 for two in 22.5 overs. Left-handed Rickash Boodram led the chase for Hillview scoring an unbeaten 60 to guide Hillview to the target. Earlier, Naparima were dismissed for 119 in 36.2 overs. Boodram and captain Bidaisee had a solid opening partnership, before the latter was bowled behind his back for 24 by spinner Ryan Bandoo. Leonardo Julien came to the middle and showed some aggression, but he fell leg before for eight. The umpire took his time to make the decision, but eventually raised his finger to give spinner Avinash Mahabirsingh the wicket. Boodram found an able partner in Teron Jadoo with the pair batting confidently. Boodram brought up his 50 in style with a six on the leg side, before he struck a four down to long on as Hillview were approaching victory. Jadoo got Hillview to the victory target with a six over long off. Earlier, Darren Samlal batted well for Naparima but could only lead his team to 119 all out in 36.2 overs. Qwinci Babel pitched in with 21, but Bidaisee (3/21) and Ronaldo Forester (2/24) restricted the Naparima batsmen. In other matches, St Benedict’s College also made a winning start with an easy eight-wicket win over promoted team Vishnu Boys’ Hindu College at Munroe Road Recreation Ground, Cunupia. It was an exciting match at Presentation College in Chaguanas with the home team losing by one wicket to promoted team Shiva Boys Hindu College. The match between Fatima College and Barrackpore West Secondary was abandoned because of rain at Barrackpore West Secondary. Round two will be played on Tuesday. Reply to "Hillview school Naps in opener"